Borawan has been the talk of the town among my peers since last year. 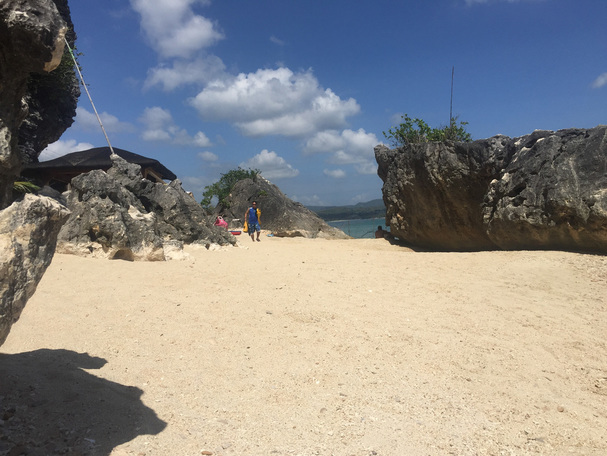 Enticed by the beautiful photos, by its reason for being called Borawan (combination of Boracay and Palawan), and by the fact that it is only a few hours from Manila, we decided to finally visit the island last February 2016. The original plan was to pitch a tent in Borawan and stay there overnight but our boatman/tour guide suggested that we stay the night in Kwebang Lampas/Puting Buhangin instead and it was an excellent decision. I have to be honest, I was not impressed with Borawan. Maybe because I had high hopes that it was as beautiful as the photos say it is. Damn filters! Hahaha! Expectations aside, I think Borawan is beautiful in its own right and its own unique ways. 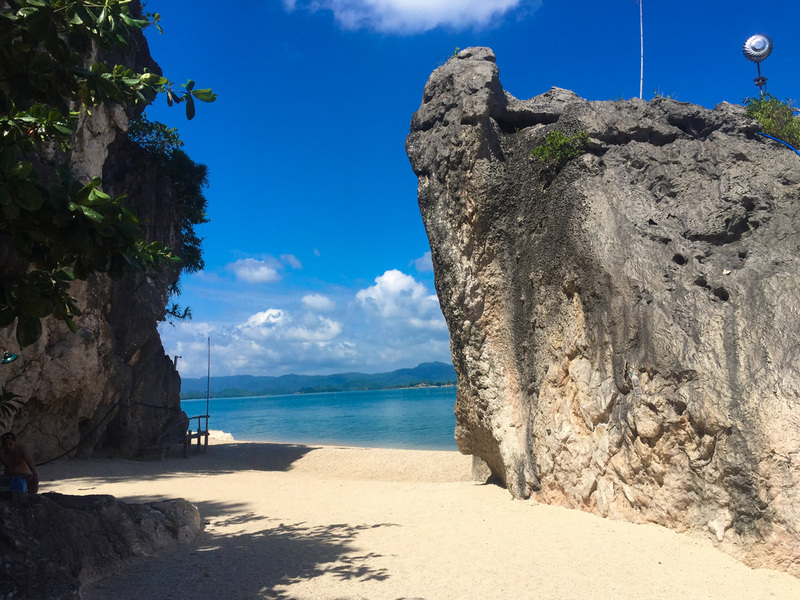 The limestone karsts accentuate the otherwise boring shores, that's why people have associated it with Palawan. The sand is not white but fine in a way, although not as powdery as Boracay's. Our visit to Borawan was included as part of the whole day island hopping tour on Day 3 of our Quezon beach hopping trip. We left Kwebang Lampas/Puting Buhangin at around 7 o'clock in the morning and went to Dampalitan Island first. We stayed in the island until lunchtime and after finishing our lunch, we headed for Borawan. We were welcomed by the caretaker, who looked more like a body guard with an M16 in hand. I was in shock for a few seconds and didn't feel at all comfortable. Lots of things went into my mind like why is he holding a weapon, is it loaded, does he really know how to use a rifle, are there insurgents in the island or will the weapon be used against guests who are pasaway and maingay like me, and so on and so forth. But fast forwarding my imagination, he was quite a cheerful guy and politely asked how many guests there were in our boat. We handed him our payments and went on with our lives. One thing that I did not like about Borawan is its murky waters. I forgot to ask the caretaker but I hope the murkiness is seasonal and at some months of the year, the water is clear. 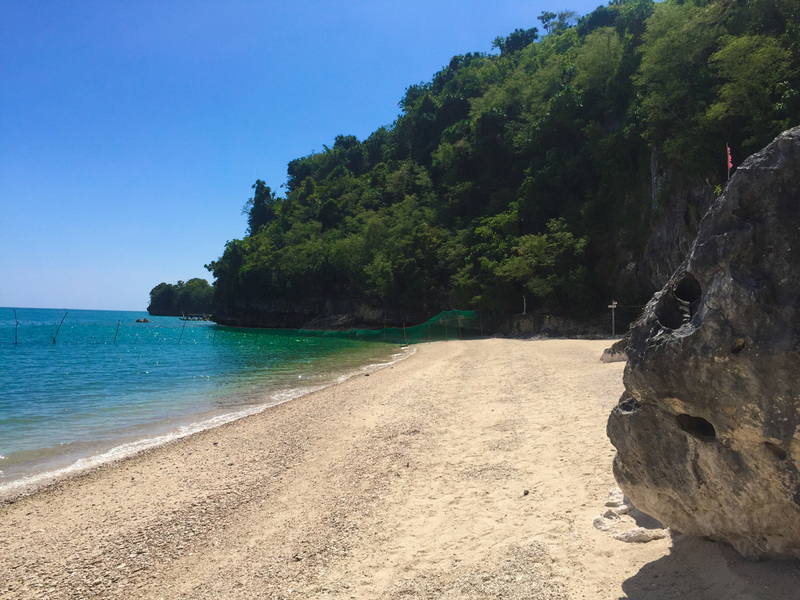 What's worse is that the waters of Borawan is infested with box jellyfishes, hence the net surrounding the swimming area. According to our boatman, about 2-3 years ago, one of his guests was stung by a box jellyfish and left a nasty mark in his thigh and leg. Honestly, I couldn't entrust my life (and the safety of my legs and my thighs) in the hands of a mere net wall but I did try to gather all the courage to swim. But all that courage vaporized when I felt what I think was seaweed or some fish swimming around my legs. 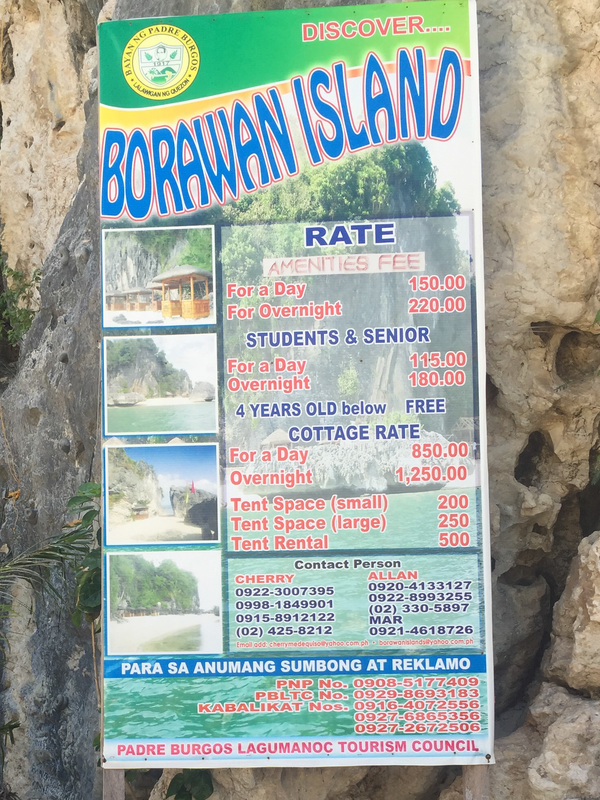 For more information about how much you need to pay and who to contact for your Borawan trip, refer to the photo below. Our key contact in Padre Burgos was Ate Thess. She owns boats and tents that are rented out to tourists. She also has a sari-sari store so you can buy all the things you need in the island from her. She was also kind enough to lend us utensils for free because we packed too light and did not bring any camping necessities with us. You can contact her at ​0921-454-3137.